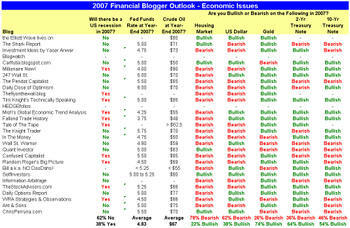 For Part 3 of our 2007 Financial Blogger Outlook, we asked participants for their thoughts on various economic topics. Sixty-two percent of those surveyed believe that there will NOT be a recession in the US in 2007. The average estimate for the price of oil at year-end 2007 is $67 -- $4 higher than the current price. 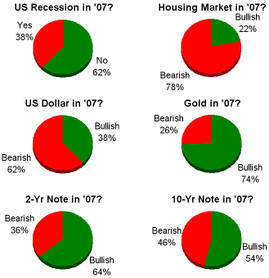 Bloggers are considerably more bearish on the housing market and the US dollar than they are bullish. However, the outlook for US Treasuries in 2007 is positive, which would be a big plus for the housing market. Please see the charts and tables below for more details on the blogger outlook. And be sure to check out the blogs of our participants by clicking on their links at the bottom of the page. We'll have one more post with a couple other off-hand topics to finish off our survey later in the week. Once a downtrend is in place for housing, do falling interest rates turn around the trend? I don't believe that was the case in the early nineties, certainly for Orange County California. The trend didn't turn around until mortgage debt-to-median income ratio fell to below the historic average. If Fed cuts rates just twice we could see a re-financing boom which always bodes well for US treasuries, let's see if this happens again. You poll the insane people from "Elliot Wave" and not the Fly? Just as damaging to credit card late payments is the effect these failures to pay have on credit ratings. I'm glad I found just the credit card consolidation plan I needed! I was amazed at the good credit card consolidation information over at ArticleMonarch.com. Great article. Love the use of graphs. After visiting http://tickersense.typepad.com/, our company, would be interested in an advertisement on your site. We provide consumers a safe and easy way to apply for payday loans online. Our advertisement format is generally 15 words long and it will contain two to three text links, which we provide. Please let us know how much your site would charge for an ad of this size. I recently came across your blog and have been reading about Debt Consolidation I thought I would leave my first comment. I dont know what to say except that I have enjoyed reading. Nice blog. I will keep visiting this blog very often. Charts show us that economic is growing quickly. Sometimes you're only looking for specific information, like a phone number or an address. If so, don't waste time reading the whole text.